The New York Daily News has republished a number of archive articles relating to Joe DiMaggio, born a century ago this week. 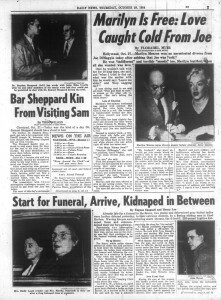 One of the sadder stories reports on his and Marilyn’s divorce hearing at the Santa Monica Court on October 27, 1954. Their marriage was short and turbulent, but they remained the best of friends – and no one was more loyal to her memory than Joe. 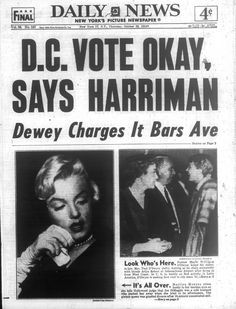 He was ‘indifferent’ and terribly ‘moody’ too, Marilyn testified, when all she wanted was love. Marilyn’s five-minute testimony was packed with emotion. She sighed. Her voice broke twice. Once it was in a sob. She brought a handkerchief toward her face, but there weren’t any tears to wipe away. She tilted her head slightly forward and directed her little words to Judge Orlando H. Rhodes. The judge seemed quite interested when Marilyn said Joe was indifferent to her. 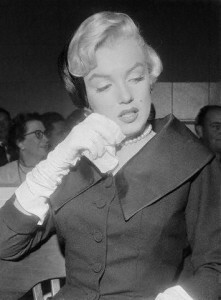 Dressed in somber black – a two-piece black silk faille suit with half-plunging shawl collar, black straw hat tilted back on her head, and white gloves – she was asked right off what her name was. ‘Marilyn DiMaggio,’ she told her attorney, Jerry Giesler. Then she plunged into her story of how Joe had spurned her charms during their eight and a half months of marriage. Not once did she refer to Joe by name. Once, Marilyn said, Joe permitted someone to come into their big house ‘when I was sick, but all during the visit there was great strain.’ She didn’t say who the visitor was.